Alice Walker received her Pulitzer Prize for The Color Purple on April 18, 1983. From Georgia herself, where the book's story takes place, Walker marched with Martin Luther King, Jr. and reportedly influenced several famous Americans, including Maya Angelou, who I met at the Kennedy Center for the Performing Arts in Washington, D.C. years after hearing her read some of her poetry at the Fox Theatre in Atlanta. 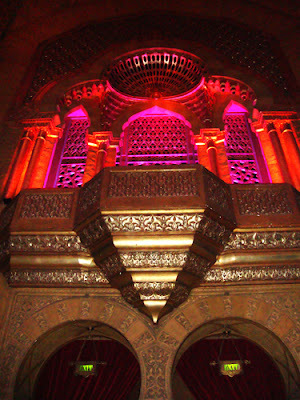 Speaking of the Fox Theatre (photo), The Color Purple, the stage version, will be showing at the Fox June 15-19, 2011. I've never read the book, but the movie is an all-time favorite, so I'm sure I will love the stage version. I'd wanted to see it when visiting New York City last year, but timing for a show wasn't in the cards.